Over the years we have become selective about the roses we carry. Hybrid tea roses are basically an annual in our planting zone, so we do not sell them. This was a little difficult for people to except, especially if they moved here from more temperate zones. Zone has become more and more a criteria for our rose selections. I try to stay with Zone 5 or less. Recent introductions of roses grown on their own root stock are the next generation of everbooming roses and they have set a new standard for hardy roses. Many of these roses are also extremely disease resistant. Then there are the David Austin Roses. The desire for antique roses began what seems like 20 years ago in our area, but who's counting. It did not take long to realize and that these fragrant disease resistant roses were limited in color, mostly magenta, and did not rebloom. 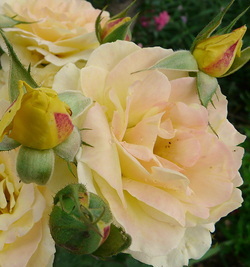 David Austin began to cross antique roses with hybrid tea roses. He created beautiful full flowered roses with fragrance, hardiness and disease resistance. The flower colors are elegant, from soft apricots to vibrant clear pinks, yellows and copper orange. I confess the David Austin Roses are my favorite. All roses benefit from heavy fertilizing and lots of water, do not water foliage. Don't forget to mulch the bud grafts in winter with leaves or other mulches. Prune to 12"-18" in fall, not climbers, just take out their old wood.